Blog Hoppin': Close Read Halloween Freebie!! Hey Blog Hoppers! I'm Erin from Eberhart's Explorers and I'm here to talk about Close Reading. Let's face it.....close reading is not a skill that often comes naturally for our students. When our students are exposed to a text, their first instinct is to often race through the text rather than engage deeply with the reading assignment. Can anyone relate? Getting your students to slow down, reflect as they read, and engage with the text (in different ways) are all part of being a good reader and are goals of close reading. Not to mention, these skills are at the heart of the Common Core English Language Arts Standards. While this can be challenging for teachers, it's something we need to model for our students and work on continuously. Nurturing these higher level skills takes time and many different techniques. So how can you get started? It's easy....I'm sharing a Close Read with you today! 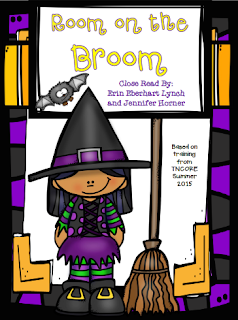 My friend Jennifer Horner and I have teamed up to create Close Reads for primary students. We have set up our Close Reads in an easy to follow 5 day lesson plan and are sharing a Halloween Close Read with you so you can get started NOW. It's not too late to implement these lessons into your school year and work towards students' digging deeper. How does it work? Each day, you will read the text and isolate a different skill. Day 1 is your Cold Read. You're going to build background knowledge, set a purpose for listening, and read with minimal stopping. This is the day you really want to hook your students and get them excited for what's to come! After I discuss our essential question, I might show a picture of a car with a LOT of people in it and discuss what students think might happen to the car. As I read, students will begin to make connections to my picture and I'll ask students how the picture and the story were similar. Day 2 is all about Vocabulary. 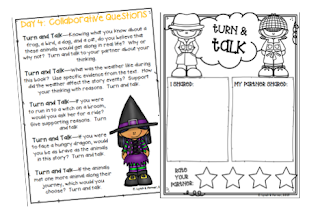 I start out reviewing our essential question and set a purpose for listening. "Today, boys and girls, I would like you to listen for tricky words within the text." Please keep in mind I have already read through the text and identified the unfamiliar words! 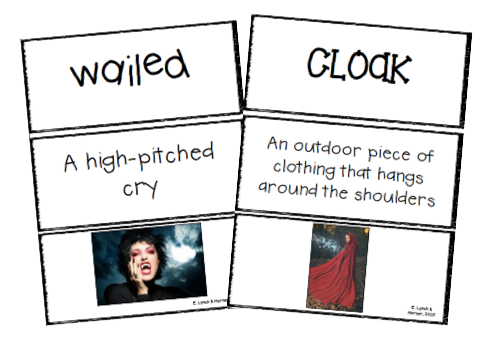 ;-) When selecting vocabulary, make sure you choose words that are most significant to the plot or meaning of the text. 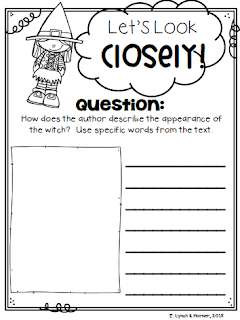 As we read, I will chart vocabulary words and model the words within the text. Students will repeat the word, say the definition, and come up with a motion. Today is the day where Close Reading really comes alive! Of course, you re read the text and establish your essential question. I start out (at the beginning of the year) modeling this and answering the questions whole group...but as we progress, students are able to do this independently. It's so exciting to see how they develop as readers! 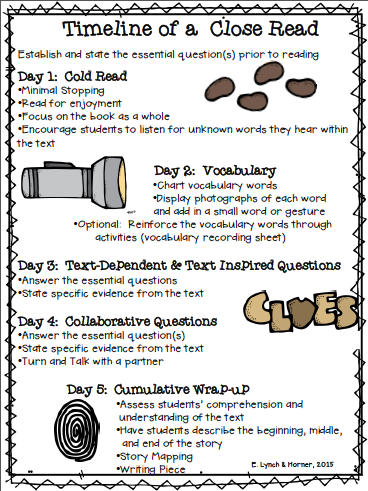 We discuss finding "evidence in the text" and "going back to the book" and students are able to show me specific details when coming up with their answer. I model and record my answer on chart paper and students engage in discussion. Multiple text dependent and text inspired questions are included with each of our Close Reading units as well as recording sheets. Day 4 includes Collaborative Questioning. On this day, after re reading the book and establishing the collaborative question, students turn and talk with partners. They LOVE doing this and getting to share! I'm very specific on what's expected during this time and try to get around to all partners and conference with them while they are collaborating. 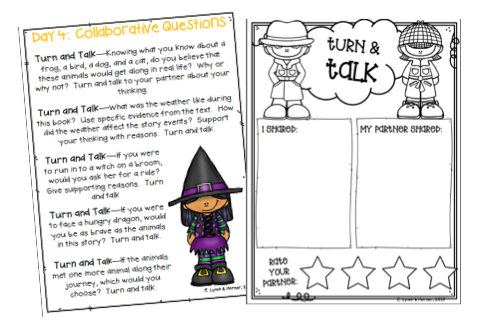 Students are also encouraged to be good listeners and write or draw what their partner said, as well as rate them. This rating holds, both the student and partner, accountable. After I have allowed enough time, we come back together as a group and I have 1 or 2 students share. Day 5 is the Cumulative Wrap Up! We do our final read of the text and I incorporate some type of activity to ensure comprehension. This includes anything from writing and answering comprehension questions to completing a story map or reenacting the story with retelling cards. A variety of activities are included to differentiate your instruction. So what do you think?? Anxious to try? Click the unit cover below to grab this Halloween Close Read from my TpT store for FREE (for a limited time only). Be sure to give it a whirl and let Jennifer and I know what you think by leaving feedback at my store. I'll also be posting more of our Close Reads soon - we have close to 17 ready! I hope everyone enjoys and has a great Sunday.